Coastguard Cottages ~ Prawle Point, East Prawle, Devon. 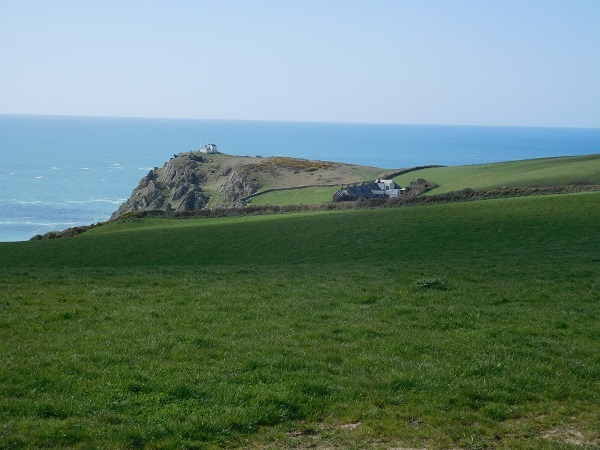 Prawle Point is the most Southern extremity in Devon. 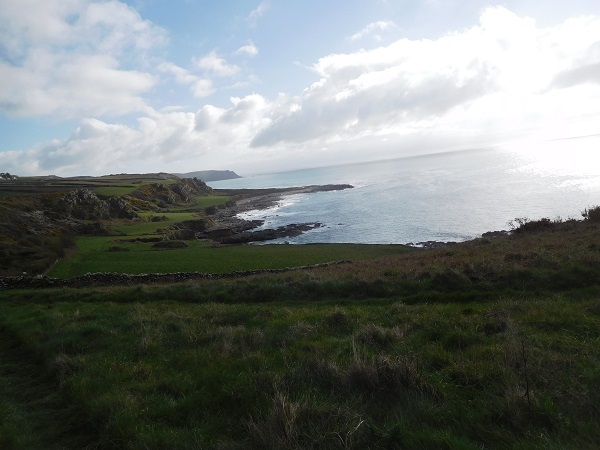 Overlooking the English Channel between Start Point to the East and Bolt Head to the West, the high cliffs here have served as a vantage point since ancient times. ‘Prawle’ is the Anglo-Saxon word for ‘Lookout’. In medieval times it is likely that a chapel dedicated to St. Brendan stood on the site of the present ‘Lookout’ and later, during the Napoleonic Wars, an Admiralty Signal Station was in operation close by. The nearby village of East Prawle in the parish of Chivelstone is mentioned in the Doomsday Book. Initially a farming settlement, it has seen very little change over the centuries. Here isolated out on the coast, you will find a row of coastguard cottages with the lookout station on the point. Originally built by Lloyds of London as a signal station in the early 1900’s there are also nine small brick built cottages along with the Station Master’s house. Later the station and cottages were taken over by the Admiralty to accommodate the coastguard service and their families. Although the signal station was vacated in the 1970’s by the coastguard service, today it is manned and maintained 365 days a year by the National Coastwatch Institution (N.C.I.) comprising of a team of 60 fully trained volunteers. In 1994 the Admiralty sold the cottages and they are now either privately owned or used as holiday lets. 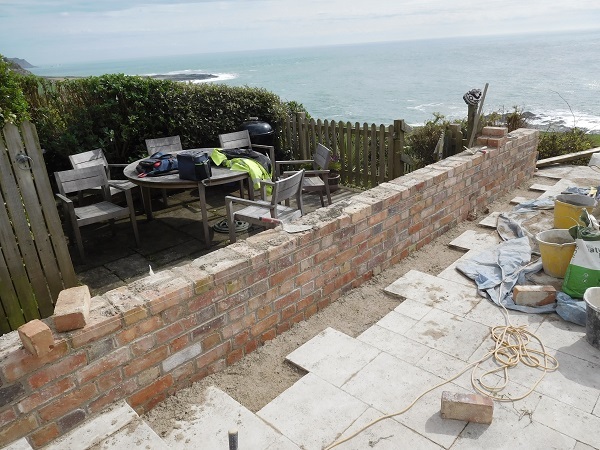 Our client had about a thousand reclaimed bricks stacked up in the their garden and wanted us to build a wall between their property and next door to give them some privacy to their patio area. The bricks had originally came from a demolished barn in Sussex. 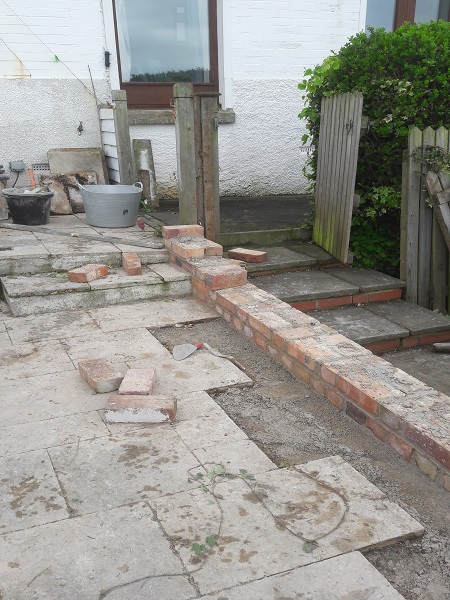 The first job was to take up some of the stone slabs on the patio where the new boundary wall was going to be built and then set out the base of the new wall. It wasn’t long before the wall was underway. The wall was ‘one brick thick’ (225mm). 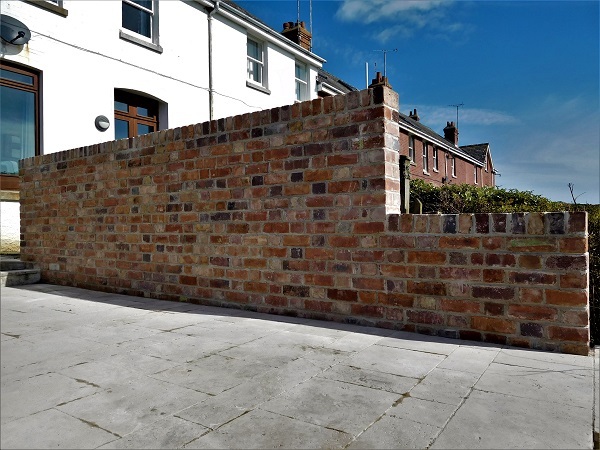 The bond of brickwork we used is known as ‘Flemish Bond’ a decorative bond traditionally used for garden walls, each course consisting of alternating ‘headers’ and ‘stretchers’. 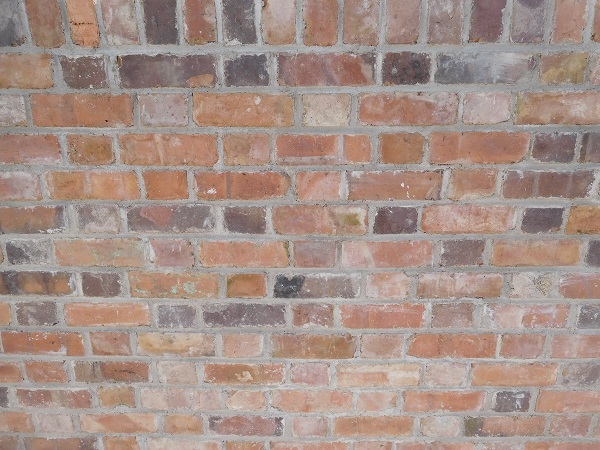 Flemish bond was first used in England in 1631 but it only gained popularity in the late 18th century after which it became the dominant brickwork pattern for house building for over a century. Its name is a bit misleading as Flemish bond is not traditionally used in Flanders or even in nearby Holland. 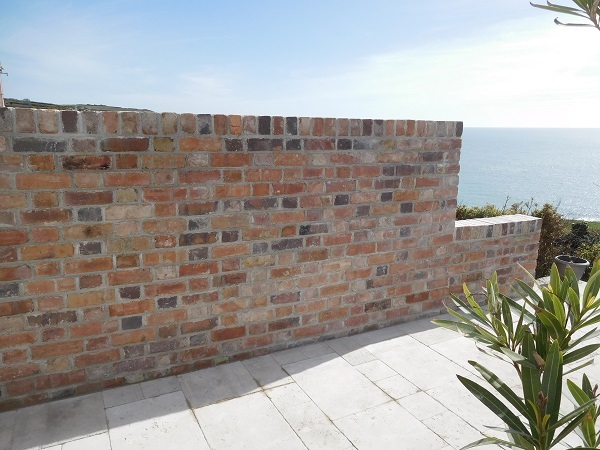 Being in a coastal environment, we used a traditional lime mortar consisting of NHL5. This is more durable against the salts and sea air. The final course of brick was laid as ‘Brick on Edge’ and the paving slabs were laid back in place. We have carried out other work here at this location. 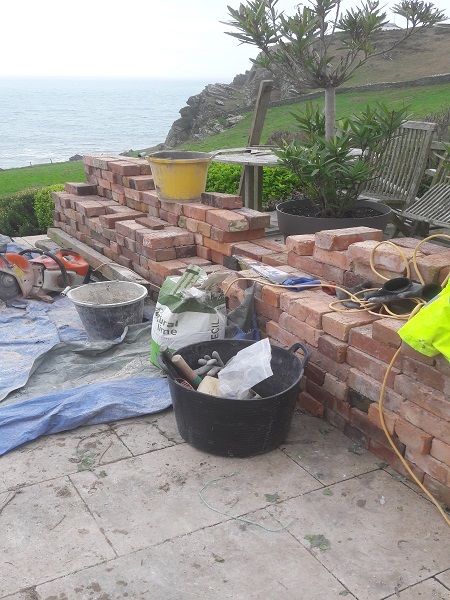 This involved the re-building and repairs to the stone wall at the entrance leading up to the cottages. You can read about this project if you click here.